Hey Guys, So this is Kopal Khandelwal !!! Welcome to my very first blog ClassyWish. 🙂 I have written many articles for other blogs but starting one for myself has always been something that I thought of. So here I am, with my very own blog where I will share away many things !! You will get to know more about me in the later posts. ClassyWish – By heart, Classy! I will show various art works which includes drawings, sketches, paintings doodles, etc. Will be reviewing fashion products for all you girls out there. Are you shopoholic too ?? I will be showcasing a lot of items to fill your carts. Will teach you about ART and design. What else ?? That’s all what I have in mind right now. So, without wasting any time I should continue with the post. I love to do all sort of craft work, shading, sketching, murals and more. And so my first post is about my art works only. I won’t be displaying all of them but yes these are some of my best works. I’ll be sharing my techniques too, about shading or how to merge colors or even how to select the best colors etc . Even some on murals and crafting too. For that, you just have to wait a while. 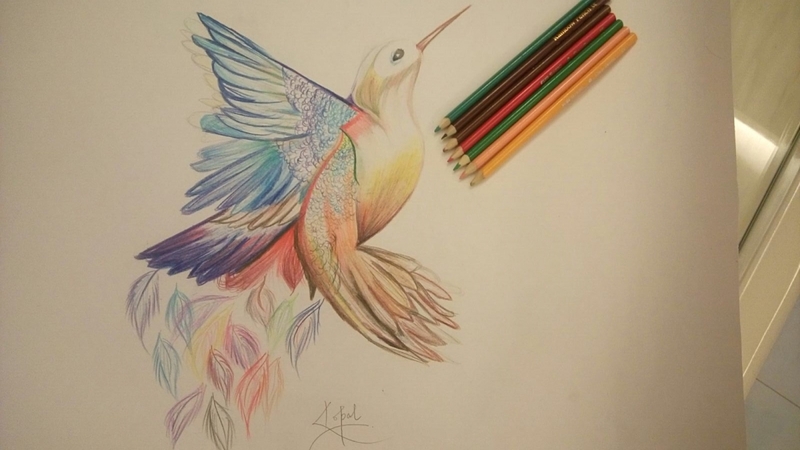 A bird that has all the colors in it, the main thing that has to be kept in mind is the direction in which the shades are to be given and also the color combination should be according to the need. Do you guys like it ?? Be honest !! Most of you guys must be knowing what a Chowk is. Right ?? Well its just a low wooden seat or stool on which you can place any idol or statue or just a flower vase. So here’s what I made. This is my work which is done with the help of paper mache and certain kundans. To give it a more luxury look I have put a 12 mm glass on top of it. This is multipurpose for a flower vase or any idol or just for. So what are your words on it ?? This is a three piece canvas of tribal art. This looks elegant and is easy to make but the fact remains the same, your hands need to perfect in giving the curves. The base is made first and then with the help of black color, painting is done. I have used camlin tube colors in this. This is a wooden mural, the base is made out of 4 MDF boards attached with two horizontal lines at the back. I have used sea shells and stones here to give an original look and also the color combination is perfect to make it look eye catching. This is my best pencil sketch till now. I have tried to give it a original look with water droplets. The color combination and the shades are need to be purely perfect in this and the same thing, direction should be proper in all. It is just the half flower may call it a artistic mind. Do you guys like it ?? BORED – Its Just a DOODLE ! A random text with random figures covering the space is what is done in doodling. Small small figures like cupcake, ice cream, octopus, bow, camera, etc. are made close to give it different look. Text like Bored, Awesome, your name, Love or anything can be written. Well I wrote bored 😛 quite a match for me. Combination of black pen and pencil with cross and flowers and a bit of shading. This painting is made with help of water colors and the shading of flowers give it a real look ,the leaves too are done the same way to give the whole painting a wow look!! This is also a water color painting with shades of white and a bit touch of sparkle. A concept of black and white color with combination of worli painting is worth eye capturing. Thumb can be used to create many different types of small objects, good for all age groups. Well yes I do make cards as well. 🙂 Made this card recently for a friend who loves music !! So these were some of my works !! Art is something I live for and always try to make something new. © Kopal Khandelwal and ClassyWish.com , 2016-17. Unauthorized use and/or duplication of this material without express and written permission from this blog’s author and/or owner is strictly prohibited. Excerpts and links may be used, provided that full and clear credit is given to Kopal Khandelwal and Classywish with appropriate and specific direction to the original content. Thanks, yes I will do share more!! What a wonderful blog. Awesome. The creativity is just awesome ❤ mam, waiting such more beautiful art!! Superb, Fantastic, Outstanding, Awesome art work. Keep it up ! I have never seen such beautiful arts from any Indian artist. You should put these in an exhibition. looking forward to see some more here.